Shannon twisted my arm and, like always, I broke under the pressure. I had avoided making jambalaya ever since our cooking class in New Orleans for reasons that were a mystery, even to me. Maybe it had been built up too much. Maybe the loosey-goosey directions from our cooking class were a bit intimidating. Maybe it was just sheer laziness. Whatever the reason, the clock was ticking. We bought a bottle of great garlic sauce to accompany the jambalaya; assuming I made it, someday. But Shannon had opened it almost immediately to use as a dipping sauce for something else, and now it was wasting in the fridge. We do our best to avoid letting food rot, so I either needed to make some jambalaya, or I needed another recipe to use the sauce. I think that was her plan all along. All systems go for launch. So the other day I finally relented; went to the grocery store, and prepared to make a meal. I had no illusions that mine would turn out as good as Chef Belton’s (of the New Orleans Cooking School). He had warned us that it wouldn’t. But I also had no intentions of making his exact recipe. I made my own, following his rough outline and adding bits of other recipes I found elsewhere. The result? I like mine better. So take that Chef Smarty-Pants. Season and brown chicken in oil (lard or bacon drippings if you’re aiming for true Southern, canola oil if you’re the Schmidt family) over medium-high heat in a large pot. Add sausage, breaking apart with spoon. Cook about 10 minutes. Add onions, celery, peppers, chilies, and garlic. Cook until vegetables begin to soften, about 10 minutes. Mix in paprika, thyme, salt and cayenne, cook one minute. Add diced tomatoes (with juice), beef broth and rice stirring to mix well. Bring to boil. Cover and reduce heat and let simmer (untouched) for 10 minutes. Remove from heat and quickly turn rice completely from top to bottom. Recover and let stand (untouched) for 15 minutes. 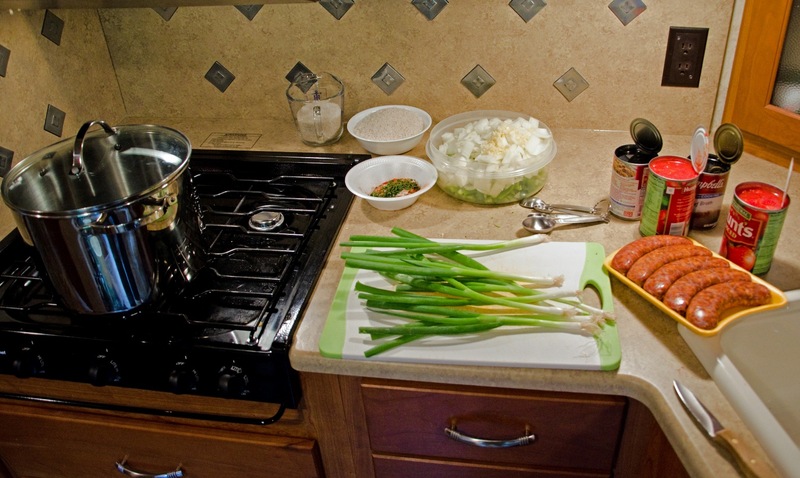 Stir in green onions and serve with Cajun Power Garlic Sauce. The quality of stock makes a big difference in the final outcome to almost all of the meals I make. The traditional direction to ‘just add stock’ is like telling an art student to ‘just add color.’ Ideally we’d make our own stock, but time is short. Barring homemade, I’ve found that I get the best results with Campbell’s Condensed broths. If someone knows of a better off-the-shelf stock, please let me know. I add the vegetables in two stages to allow some to cook longer than others, increasing the range of flavors and textures in the final meal. Next time I’ll probably slice some of the sausage and leave it chunky, again increasing textures and creating a meatier jambalaya. I used chorizo sausage, because I couldn’t find Andouille, and it worked great. Next time I might substitute V-8 or tomato juice for half of the beef broth to give it a bit more of a tomato’y flavor. Next time I’ll probably play with the spices by adding some white pepper, onion powder, rubbed sage, bay leaves, etc. Who knows? Thanks–I’ll make this tonight with some chicken sausage I’ve been wondering what to do with. I’ve never heard of the Cajun Garlic Sauce, though. Will have to look for it. The Cajun Power Garlic Sauce is something we discovered at the New Orleans Cooking School. I think you can probably find other garlic sauces that are similar. 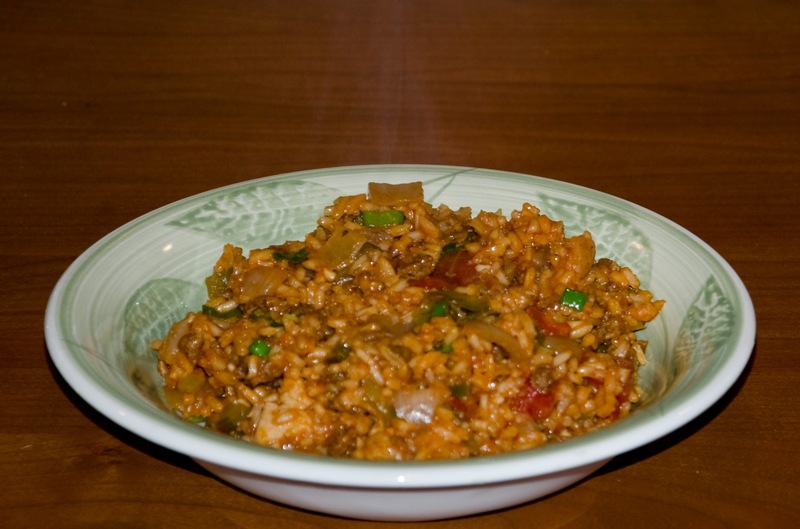 It’s got tons of flavor and really works well with jambalaya. Barring that, good old-fashioned hot sauce goes great too. Sounds delicious! I’ll make that one of these days. I wonder if i could even throw in a few shrimp instead of the chicken… don’t they do that with Jambalaya also? Or is that me making things up? You absolutely can make shrimp jambalaya – or alligator, or crawfish, or . . . But because shrimp are more delicate than chicken, I’d probably cook them up first – maybe with some garlic and butter – and add the cooked shrimp when I turn the rice. That way they won’t turn to mush. Have fun with it, and enjoy. You inspired me to make it last night and I loved it. I used smoked pokish sausage and cooked shrimp and added both only about 10 minutes before the whole things was done, so it could soak up the flavors without overcooking. Turned out great! Oh, and I didn’t have white rice, so I used brown rice – of course it took much longer, but tasted just as good. I think it works since the flavors are so strong to start out with. I’m glad you wrote this post. I’ll keep playing with this recipe and try different variations. Thanks! Thanks for letting me know how it turned out. Smoked polish sausage, shrimp, and brown rice = completely new recipe . . . which is the entire point. It’s such a great dish, and so flexible. You can do almost anything to it. a pinch of love and a dash of kindness that goes in every home cooked meal usually wins out. It does look yummy. i love all cajun cooking and as Emeril says as long as you have the “trinity” in will be good…. Ahhhhh guanaanteeee…..
It’s true. Even without adding a bunch of other spices, jambalaya comes out pretty decent just by mixing the flavors of the base ingredients. Re: off-the-shelf broths – I’ve found an Organic Brand called “Better that Bouillon” that I love. It comes in Beef, Chicken and Vegetable. First found it at the local health food store, but have since seen it at Safeway (usual supermarket). It comes in a jar and is more of a soft paste than the typical cubes. You might try it. It’s a lot easier to vary intensity with this gooey stuff. One teaspoon = 8 oz. can, so may even be better for storing in an RV. Good tip, I’ll have to look for that. The Campbell’s condensed broth isn’t what it used to be. They dropped the “Double Strength” from the can and I think from the recipe too. I’m looking for an alternative, so maybe Better than Boullon is it.